The JOK II is a CE-marked Diver recovery harness to permit recovery of a fully-kitted diver from the water in air diving or bell diving conditions. Lifting can be via a rear of neck 'D' Ring or with a spreader bar across the two front of harness lifting points. The under-leg straps are essential for diver recovery. 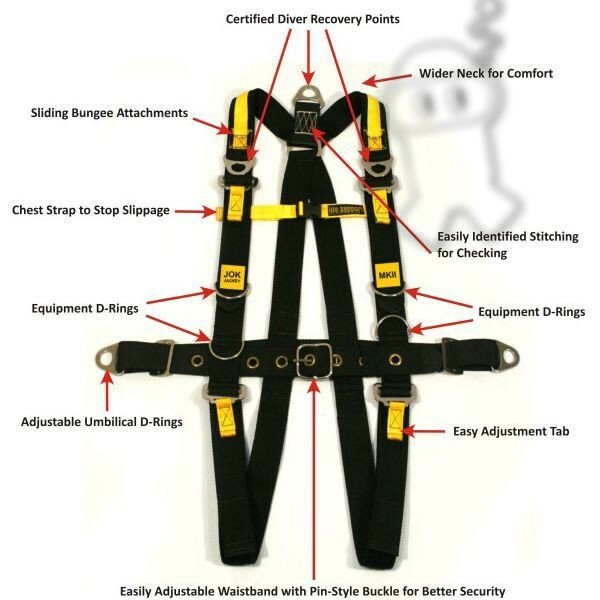 The JOK II harness was tested at 900Kg/N with no failure of stitching or webbing. The special profi le cut 'D' rings were selected to overcome any doubts which may occur when using normal welded 'D' rings for lifting purposes as we uncovered that the manufacturers of these traditional items would not load certify them as they could not guarantee the weld quality. Do you have any questions about JOK Diver's Recovery Harness MKII?